The dates tend to be one or two working days before the opinions are released to the public. So, they are not actually the date of the opinions. The Federal Circuit has not published any explanation on its web site for this new procedure. My best guess is that perhaps it reflects the date that the opinions are submitted to the clerk’s office. And, perhaps the dates are intended to be one mode of precedential tie-breaker, if two opinions are released officially on the same day but with opposing viewpoints on an issue. 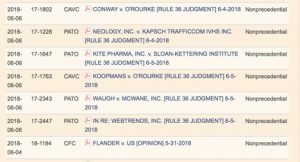 See Patently-O, “Priority of Precedent: When Same-Day Federal Circuit Opinions are in Tension” [Link]. 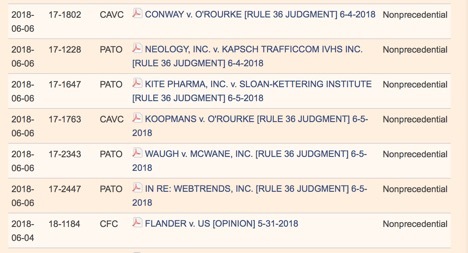 Curiously, the Federal Circuit is now publishing the list of cases without dates. And, the court has removed the dates that were previously listed. So, we are back to the old system. This entry was posted on Thursday, June 7th, 2018 at 10:26 am and is filed under Uncategorized. You can follow any responses to this entry through the RSS 2.0 feed. Responses are currently closed, but you can trackback from your own site.